To me, it hasn’t really hit met that much yet that I’m going to be playing Game 1 of the World Series in 24 hours. I just think about playing a game and trying to treat it like every other game and prepare myself the same way I always do. I’ll just wake up and do the same things I always do on a daily basis. For me, World Series Game 1 will be the same as Day One of the regular season. That’s how I’ve tried to look at it since the playoffs started — just play and don’t worry about things too much — and it’s worked for me so far. I’ve been swinging the bat real well in the playoffs and feel good and I think the main reason is I’m healthy. I think that’s the biggest thing. There are little things here and there during the year that nagged at me and when you feel healthy and feel good, good things usually happen. I’m really excited just to get out there and play. Adrenaline helps this time of year too when you play in these games and these situations. You don’t feel a lot of the aches that you go through in the second half of the season. To be healthy and playing in October is awesome. You just have to use your adrenaline in the right way, because it can be good and bad. If you use too much adrenaline and get too excited, that’s when you get in a funk. The easiest thing is to just try to relax and try to keep it simple and do the little things. Try not to do too much. I think when you try to do too much, that’s when you fall into a bad groove. swing the bats and pitch well. For us, it’s all about playing our game. We played these guys in June and they took two out of three from us, but we can’t take too much from that series that will help us in this one. Maybe you’ll remember the pitchers you faced or some of our pitchers will remember the batters they faced. But Interleague is always tough, it’s always in June, that’s early in the year. You can’t assess it that much. This Colorado team is a lot different team now. These guys have won 21 out of 22 and that’s just remarkable. That’s unbelievable that they did that. But that’s in the past. It’s amazing that they put together a string like that just to get to the playoffs and then to get all the way to the World Series. It’s a great feat, but Game 1 is a whole different story. You can’t look at past records because those records don’t matter. Everyone is zero and zero. You have to put all that aside and play the game. It’s obviously great to start the series with Josh, but to tell you the truth, I was laughing at everyone obsessing about Josh needing to pitch Games 4 and 7 for us to win the last round. I didn’t think Josh needed to pitch Game 7. I thought Dice-K got a bad rap and people were dogging him, but he pitched well. People get on Dice-K, but Dice-K has pitched well. As for Josh, you’re confident as a position player when you start a series — or a game — with him taking the ball. You’re excited because you have the best pitcher in the game maybe, or in the American League, pitching for you. Every time he steps on the mound, we’re confident. That’s the biggest thing. Having confidence in your teammates and your pitchers is huge. We have confidence in all of our pitchers. It’s just that when Josh is out there, we feel at extra ease in the fact that when he’s on … he’s one of the best pitchers around. The guy is the best pitcher when he’s on — he’s shown it. Hopefully he shows it again in Game 1. It’s unbelievable. It’s a great feeling to come out here in Game 7 and play so well. I’ll tell you what, it was unbelievable for us to win here at home, and a lot of people doubted us, but we didn’t doubt ourselves. That’s the biggest thing. When you believe in each other, you can go a long way in life. If you ask me what the key to this series was, it was just sticking together. There’s a lot of people that are negative, and there’s a lot of people that doubt us, and they want to get on the bandwagon and say we can’t do it. You know what? We proved everyone wrong. We did it in 2004 and we did it again now. Maybe one of these days, people will start having a little more faith in us. We have to play for each other. It’s a business, both in the media side or other sides, where people might write bad things about you. You know what? Just take it and go with it, and take out all that aggression on the baseball field. This was a tense game tonight, but when Pedroia hit that home run, it was huge. That was the biggest thing for us. We’re just excited to put those runs across. Hey, we added on. That’s what we wanted to do, extend our lead. I know the Indians are taking a lot of heat for not sending Lofton on that hit down the line in the seventh, but that sign the ball hit is not usually there. Usually, that ball kicks right to the shortstop. That’s one of those things I think third-base coach Joel Skinner prepared well for; that was actually a good call on his part. It just didn’t bounce his way, and we were very fortunate he held him up. Nine out of 10 times here in Boston, guys get thrown out trying to go to second or going home on balls hit down there. We get the double play right after that; that was just huge. We were so excited to get back in the dugout. That was the biggest turnaround of the game. I had a good series swinging the bat, but I don’t mind flying under the radar. I’ll fly under the radar any day of the week. That’s just how it is. I’ll fly under the radar as long as we win. To me, I’m just excited to play this game. I’m very blessed in life to be able to play this game. I’m very blessed the Red Sox have stuck with me. That’s the biggest thing for me — the Red Sox have confidence in me and that’s all I need, for somebody to have confidence in me to let me play this game, because I love to play it. I give it 100 percent every day. I’m all about just having a lot of heart and playing the game. I’m real excited just to go to the World Series, but I’m just trying to enjoy what we have right now and I’ll just prepare myself for that first game at Fenway on Wednesday against the Rockies. It was good to get the lead tonight and build a little more confidence on this team. I think that was a huge factor, just trying to get ahead and trying to get some runs on the board against C.C. I was glad I was able to help there, with that solo homer in the first. Getting on the board first is huge when you have Josh Beckett on the mound pitching gems. Sometimes all he needs is one run. Getting that one run was big, and then we were able to add on. I think once we were ahead, 2-1, guys were definitely more confident, but also, guys knew that we needed to get more runs. This is a great Indians offense, and they can get back in the game with one swing. For us, we were just excited to get those runs across in the seventh and eighth. That was huge for us. What Josh is doing right now is great. You wish he could go out there every day and throw the ball, but he can’t. He’s throwing the ball well, and we’re exited to have him on the mound pitching, because he’s dangerous out there. It just seems like he’s locked in and throwing his pitches where he wants, and ‘Tek is calling a great game. We’ll take him any day of the week out there. Game 6 back in Boston is going to be great. I think the fans are going to be a little bit more confident. It seems like it was a little bit of panic mode while we were gone, and I think it’s huge for us to go back and get the momentum going in our favor and for us to win a game. We know we’re still facing elimination, so we’ve got to win that game on Saturday. We’re fortunate to have Curt Schilling on the mound in Game 6. He was definitely the guy that helped get us through 2004, and we’re hoping he comes out and throws a great game. If he can throw a great game and we can get a couple of runs across for him, we feel that we can hopefully win that ballgame and push it to a Game 7. I think the biggest thing you’ve got to do is, you have to go out there and scrap and play like there’s no tomorrow. I think sometimes you can be more of a dangerous team when there is no tomorrow. For us, we’ve been in a lot worse spots. We’re down 3-1 now, but we were down 3-0 in 2004. We just have to go out there and play for the day — just go out there and play as hard as we can and not worry about yesterday, and we’ll just play for the present. For us, we want to take a plane flight home on Thursday night and play a game in Boston on Saturday. We think if we can get to Boston and play, we have a good chance. We have Josh on the mound in Game 5. There’s nobody we’d rather have out there. We have to play like there’s no tomorrow, because there isn’t. You have to go out there and give your all, give it 100 percent. You have to battle. It’s going to be a dogfight out there. We have to go out there and find a way to get back home. I think a lot of times you’re a dangerous team when you have nothing to lose. For us, we want to go back home. We just have to try to win one game. What can I say about tonight? It just wasn’t our inning. You lose ballgames when you can’t stop rallies. I had that foul ball down the line that I couldn’t come up with. I slipped a little, and Dustin and I sort of bumped into each other. If we could have come up with that ball, it would have been big. But we didn’t. You can’t be in panic mode. 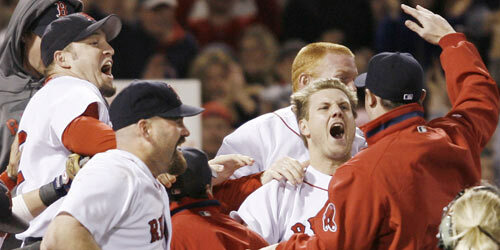 A lot of times, it’s panic mode in Boston, but we’re not in panic mode. We were in a situation a lot worse than this in the 2004 ALCS, and we won that. This is easy compared to 2004, when we were down 3-0 against the Yankees. For us, we’re not in panic mode. We’re just excited to go out and win a ballgame tomorrow and get this series back to even. think we can take the series if we can just put some runs together. We didn’t hit in a timely manner and we didn’t get the breaks that we needed tonight, and we had our opportunities, we just didn’t capitalize on them. We were hitting the ball good. It was just one of those nights when we just couldn’t put things together, and you just have to shake it off and move on to the next day and not worry about it. We’ve still got a long series to go. We have to come out tomorrow and win Game 4 and tie it back up. There were a couple of pitches here and there where if they go our way, we may have a couple of baserunners and this and that. But they just didn’t. You have to deal with it. Dice-K pitched well. He had good velocity. He had that one pitch to Kenny Lofton that just wouldn’t stay in the park, and J.D. wasn’t all that far from catching it. That was huge at the time. We face Paul Byrd in Game 4. You just have to keep him in the strike zone and not swing at his pitches. When you get a good pitch to hit, you have to get it. He’s going to mix it up a lot. You just have to be patient, but also be aggressive. I feel good with Wake on the mound. He can be dangerous. If he has the knuckleball working real well, it’s going to be tough. We’re excited to come out and play Game 4. It’s a new day. mound. That’s the wrong philosophy. You just have to put it all aside and give it all you’ve got when you go out there on the field the next day. It definitely would have been great to go 2-0, but for us, we did some things well. We didn’t do the other things well. But hey, we battled and played hard and played tough. It just didn’t go our way there at the end. I had a chance to win the game there in the bottom of the ninth inning, with Jacoby Ellsbury on second, but I hit a line drive to center field right at Grady Sizemore, and he caught it. Not much I can do about that. I saw it go right to him and Sizemore is a great center fielder. It’s just one of those things — you do everything right and it doesn’t always pay off. There’s a lot of luck involved in this game. You go out there and try to do everything the right way, and sometimes that’s how it works. It’s better to be lucky than good sometimes. When you lose, it doesn’t matter — one run, 10 runs, 20 runs. A loss is a loss. In the end, for us, it would have been nice if we could have gotten in the run with our big guys up in the 10th, but we just couldn’t. The ball just wasn’t bouncing our way. It happens sometimes. Trot is a tough out. We know better than anyone that we don’t want to see him up there in that situation. He found a way to get a big hit for his team there. It’s 1-1, but I think we’re looking real good. We have full confidence in all our pitchers and our ability to win. This one just got away from us. We could have easily won this game. Now we just move on. It looks bad on paper, the score, but we were one swing away from winning. I think we had a great game against C.C. Sabathia. We made him pitch. The biggest thing was that we made him throw strikes and laid off the bad pitches, and for us, we just went out and attacked the pitches we could hit and laid off all the pitches we couldn’t. Guys had great at-bats and had timely hitting. That’s the biggest thing: timely hitting. Our whole goal was to get him out of the game as quick as we possibly could, but sometimes, it doesn’t work because you’re facing such a great pitcher. Tonight, we were very lucky to work the counts and get the pitch count up, and basically we just battled and had great at-bats. We forced him out of the game, and that was the key to the game for us. Of course, we had Josh going and he pitched another great game. The ball Travis Hafner hit might not have been a home run on some days. He hit it so high and so far that it just caught up in that wind. When the wind is blowing in, that ball is not even close to getting out. Tonight, the ball got out and you have to tip your cap. He’s such a strong guy, that ball went a long way. But Josh bounced back and threw the ball well. I think the thing that hurt him was the long innings. David and Manny are on a roll right now. They’re just having great at-bats. They’re seeing the ball real well and making the guys not try to do too much, and that’s the biggest thing with David and Manny — when they’re locked in, they’re not trying to do too much. They do a really good job of seeing the ball and just hitting the ball and getting on base and driving in runs. As a lineup, we’re starting to get it going. I think when those guys get it going, it makes it easier and more stress-free for the other guys in the lineup. That’s the big thing right now, we’re having all the guys contribute on every level. When you get this team, from one through nine, hitting well, it’s one of the toughest lineups to face. We need to keep the pressure on in Game 2. We have Schill pitching, and if he throws the ball the way he can, and if we can get to Carmona — our big thing is we want to get Carmona early and get his pitch count up and try to do as much as we can to get him out of the game quick — we’ll be successful. excited to get it going and try to win a ballgame. young and has some veterans on the team to help them out. success is because of the guys they’ve brought up through the Minor Leagues. They’ve done a great job with it. these are the times when it pays off. It seems like a normal game. started and come out with a "W" in Game 1. It’s a great feeling to sweep the Angels. We played a great game today, swung the bats well, pitched well. I think the biggest key to any series is to end it, and that was the key today. We came in not wanting to prolong it and just take care of things, and that’s what we did. This was a phenomenal game for us. 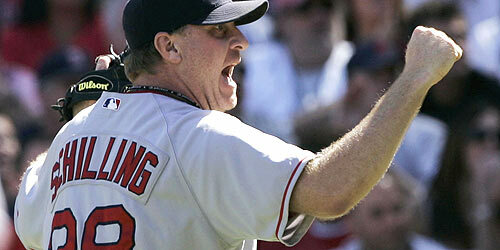 Curt Schilling was great. He threw the ball well. He spotted all of his pitches and got out of the jam that one inning, in the third. That was unbelievable. It just shows his heart and his dedication, and how great of a pitcher he is, to go out there and do that today. We’re so proud of his effort. Right after Schilling got out of that jam, Ortiz and Manny hit the back-to-back homers. That’s huge. That’s awesome for them, and they had confidence coming in and that’s what we needed, was those guys having confidence in their hitting. When those two are hitting, it makes our lineup that much better. I think that we’re starting to click here. We’re pitching well, we’re playing our positions well and we’re hitting well. We’re getting timely hits. That’s a big thing this time of year — getting timely hits and playing great defense. But I always say that it comes down to our pitching. As long as our pitching is going good, this team is going to come out on top. Now we’re going on to the ALCS against the Indians or Yankees, and we’re real excited. That’s one step away from the World Series. We just have to be focused and have to be ready to play Game 1. We have to be ready to win, whoever we play. We have a little rest here this week, but we just have to stay in game mode and be ready once we start again on Friday. We’re just going to enjoy what we have right now with this victory and go home and prepare tomorrow. We can’t worry about anything yet, because today we just have to enjoy and celebrate. Tomorrow, we’ll wake up and be ready to get focused on practicing for the next series. Well, it’s time for another long flight. Once we find out who we’re playing in the next round, I’ll be back on the blog to look at that matchup. It was unbelievable once the ball left Manny’s bat. We all knew it was gone, but just for him to put that great of a swing on the ball was unreal. That’s why Manny is so unbelievable. That’s Manny right there. have hit a car on the Mass. Pike. The game was long, definitely longer than the first one, but we were excited and having the home-field advantage is the big thing, and we protected. To win this game and to go to Anaheim with a 2-0 lead is huge for us. I think all of us, now, we just want to win. We know with one game, we can end this quick if we go out there and play well and win that ballgame out there on Sunday. We want to win the first game in Anaheim. We don’t want to play another game. For us, we’re just going to go out there and play our game, and hopefully we can wrap up the series as soon as possible. It’s great to have Curt Schilling out there for Game 3. Schill is going to be prepared and he’s the most prepared pitcher we have when it comes to knowing what he wants to throw in certain situations. We’re excited to have him out there. If he goes out there and pitches six strong innings, we’re going to hopefully give him some run support and get a "W."
When you have a six-hour flight, like we do tonight going to Anaheim, it’s huge just to have that advantage of having a "W" and not having to go out there with a loss. The flight will be a lot more fun. When you’re winning, you get an enjoyable rest on the plane. When you lose, it’s a long flight with a lot of people sleeping and not in a good mood. Anyway, I have to catch the bus to the airport, so I’ll have to wrap this up now. I’ll talk to you all again after Game 3.